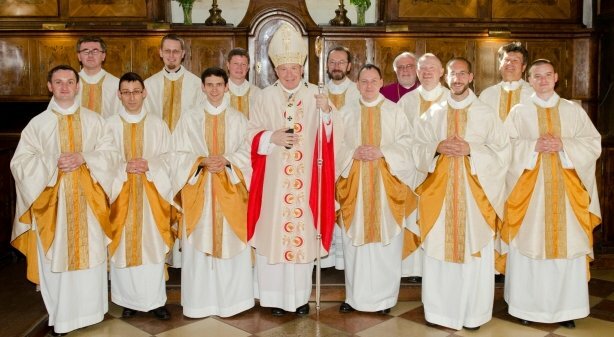 On the Solemnity of the Sacred Heart, June 15, 2012, I was ordained to the priesthood by Christoph Cardinal Schönborn, together with five other men, in St. Stephen's Cathedral, Vienna. More photos and downloads are available at www.priesterweihe.at. Please say a prayer in thanksgiving for the grace of this vocation, and that the Lord make us holy and good instruments of his work! Congratulations and may the Lord bless you and your work! Congratulations from a reader in Thailand! (I found your site because your book has been an immense help to me.) Will pray in thanksgiving and petition. Salve! I have just taken your photo with the rest of the delegates at the theology of vocation conference, and only now has it struck me that you are the Joseph Bolin to whom I referred on my little blog last year, in particular to your excellent paper on three approaches to vocation discernment. Then you were a seminarian, but now freshly ordained! Blessings on you and your ministry. Ad multos annos. May our Lord and Mary mother of all priests keep you on the path of divine love. <> said Bl. Mother Teresa ! Previous Previous post: "For many" or "for all"? Pope Benedict on the Translation of "pro multis"